I finally have got around to trying out the Gwdihw Smoochy Lip Balm my Sister gave me for Christmas. She treated me to the cherry flavour and it is delicious. More importantly I like the fact that the balms are handmade in Wales using 100% natural ingredients. The cute packaging is an added bonus and the tin is the perfect size for pockets.I love the way my lips feel after using this product. They feel soft, moisturised and the effects last so I do not continually have to re-apply during the day. The balm is solid which I prefer. I hate the lip balms where you dig your finger in and get a blob of product, like when you stick your finger into Vaseline. With those balms it feels sticky and one gust of wind results in your hair glued to your face. 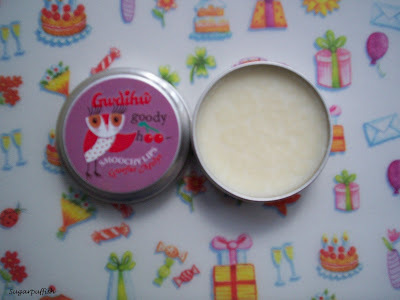 Gwdihw lip balm melt into a silky oil consistency and sink into your skin without leaving a residue. Smoochy lip balms come in a variety of flavours - vanilla, pineapple, cherry and orange & lemon. Do check out the Gwdihw website, as lip balms are not the only products they make.